S.T.Dupont Cohiba Line 2 Lighter is dedicated to the most famous cigar brand in the world: Cohiba. 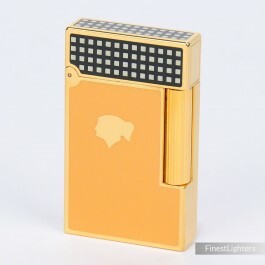 The lighter is finished in gold and decorated with dark-yellow Chinese lacquer. On the lighter is depicted a golden Taino Indian head, the symbol of Cohiba, and the lid is decorated with the same black-and-white squares motif as Cohiba cigars' band. The lighter comes with a double flame cigar burner. Only 3000 individually numbered pieces of this lighter were made in the far 2003. One of the most beautiful and sought after lighters of the entire S.T.Dupont's production, completely sold out. Please note: the item is new / never used but there is a small dent on the base due to handling in the store (see the last picture).